I am a Year 8 student at Glenbrae School in Auckland, NZ. I am in Room 10 and my teachers are Mrs Raj and Mrs Parker. 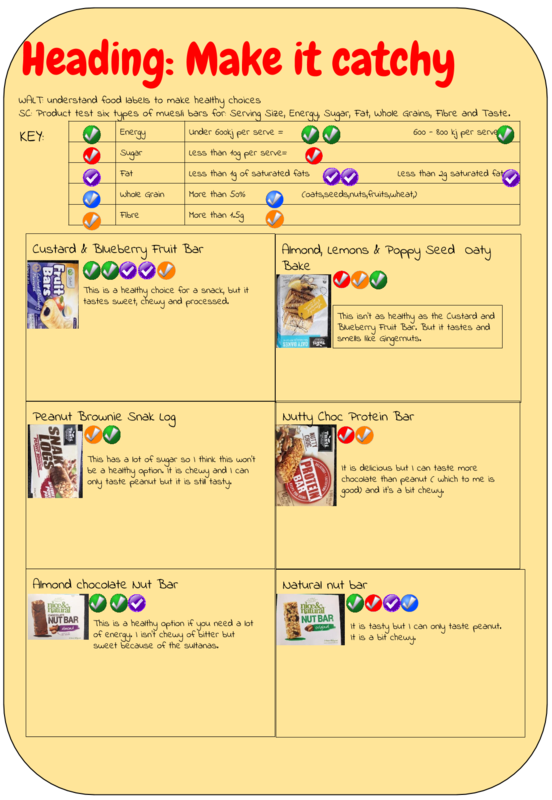 I analysed the food labels and it helped me determine weather the muesli bar is healthy or not. Then I tasted the muesli bars and I could taste the sugar that was in the bars. I learnt how to read labels and what their meanings are. I also learnt how to decide weather a muesli bar is healthy or not. List some foods fit each of the flavour receptors. Sleep is when your body is resting, conserving energy, for a long amount of time. Sleep is a natural state of the body that an individual goes through daily. During your 8-10 hours of sleep your internal organs are working, but your five senses aren’t as alert and aware of your surroundings. Why do children between the ages of 10-16 need 8-10 hours of sleep? At this age, while we are going through changes, sleep is helpful in so many ways. When we are asleep our body is growing, we’re getting taller, our hair is growing, our nails are growing and our body is relaxing. When we’re sleep deprived , we may feel the need to eat more which can lead to weight gain. When we’re sick , sleep can help our body heal, whether we have a cough or a flu. If sleep is cut short, which isn’t good most of the time, the body doesn’t have time to complete all of the phases needed for muscle repair. When we wake up our mind isn’t prepared to concentrate, make decisions or interact in school and social activities. If we don’t get enough sleep it can affect our day in a bad way. We get tired during school and don’t complete our tasks. We become angry instantly, take it out on the people that surround us, then cause trouble with others. Sleep affects the way we look, feel and perform on a daily basis. So sleep can help us get through a long hard day, that is full of learning, at school. You have an internal "body clock" that controls when you're awake and when your body is ready for sleep. The rhythm affects every cell, tissue, and organ in your body and how they work. If we are sleep deprived, due to a short amount of sleep, it may cause mental, physical and health problems. So our body is growing and healing. It also gives us a positive attitude towards everything we do, mainly toward school, which can help us achieve our life goals. If you don’t get enough sleep, you may not feel refreshed and alert when you wake up. In conclusion it’s important for children between the age of 10-16 to get at least 8-10 hours of sleep mainly because we are growing and going through changes. The outer aisles usually contain the healthiest food. Visiting the inner aisles later in your shopping trip will reduce the chances of you over doing it one snacks and processed foods. Frozen or canned fruit are convenient. Spoilage is less of a concern. High quality brands will succeed in supplying fresh produce when it comes to taste and nutrition. Sometimes frozen vegetables are packed with extra salt and fat. Don’t buy frozen vegetables that have large dents, a swollen appearance, or is leaking. Some of them have sauces or additives. Choose vegetable that look fresh and colourful. Most should be crisp and firm. When choosing fruits, avoid ones that are bruised. Today Room 10 walked up to the field and practised high jump for athletics. Before we started Mrs Parker showed us a few techniques. Mrs Parker told us to do the scissor jump so that we can jump higher, jump closer to the mat so that we jump over the rope and stay on the mat, try not to freeze or you’ll lose your momentum and to believe in yourself. The girls didn't want to do it, so we went for a run. Once we got back the boys had already finished. None of us were up to doing it, so Erina ran first then Nikita and then (unfortunately) me. I wasn't confident and I thought that I would fail but I made it over the rope (bar), and I fell off the mat. Mrs Parker gave me advice on how to jump over the rope and land on the mat. A lot of us improved but some of us chickened out. There were a bunch of us that nailed it because we had good technique, we were confident and we didn't doubt ourselves. Moli made the highest jump which was 1.35 metres. I really enjoyed it today because no matter what we were cheering each other on. That no one ever finishes the fruit because it ripens too fast. Separate the banana’s from the rest of the fruit. Today I learnt why fruits ripen faster around banana's.I also learnt what other fruits have ethylene (C2H4). Today I enjoyed doing my maths because I like to be challenged. Maths is fun for me because I love it and when I grow up it helps me.